WASHINGTON — Sheets of rain and powerful winds made their way through the D.C. area, soaking local roadways Friday night. Both directions of Rock Creek Parkway between Kennedy Center and Beach Drive were blocked because of street flooding. The National Weather Service said an estimated 2 inches of rain fell over Northeast D.C., College Park and Silver Spring starting around 5:40 p.m. and into 6 p.m. Earlier in the night, a Flash Flood Warning was in effect for much of the D.C. area. 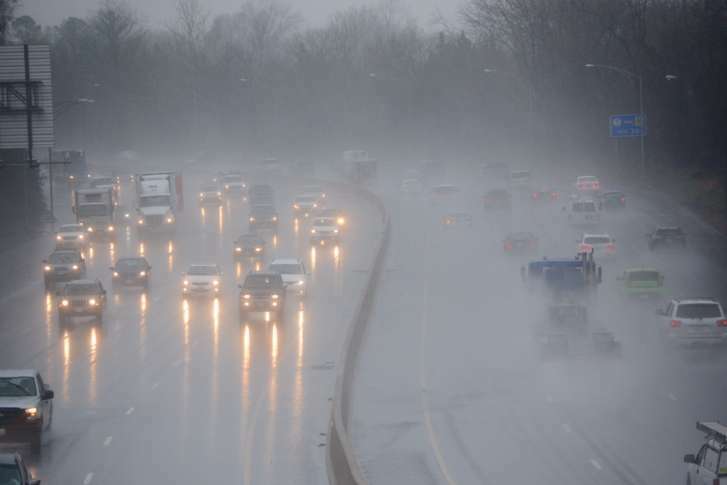 Officials in Fairfax County, Virginia, had urged residents to move their vehicles to higher ground Friday and Saturday afternoon due to wet weather. On Friday night, the game between the Nationals and Cubs started after a long delay, but was delayed and eventually postponed after another significant delay. The game is being made up on Saturday afternoon at 3 p.m. However, fans who are not able to attend the make-up game can exchange their ticket from Friday night’s game for another home game this season. After this weekend, the Nats have seven home games remaining against the Mets and Marlins. They finish the season on the road in Colorado. The region is expected to get a good soaking this weekend and beyond after September kicked off with a sweltering dayslong heat wave. On Saturday, expect more cloudy skies and cooler temperatures with highs only in the mid 70s and scattered showers passing through the region. The rain chances are even higher on Sunday, especially in the morning. High temperatures remain only in the low to mid 70s.